Posted October 26, 2006 by grohling & filed under Uncategorized. This meeting was held jointly with the BCS Chester and North Wales Branch over a video link between two CCLRC labs: the Rutherford and Appleton lab near Chilton in Oxfordshire and the Daresbury lab in Cheshire. Dr. Brian Day, secretary of BCS Oxfordshire branch, introduced the evening to branch members and guests at the Rutherford lab, and, using the video link, to the audience at Daresbury. 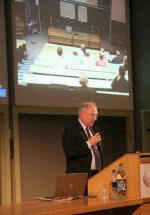 Our speaker at RAL was Dr Keith Norman of Tessella. 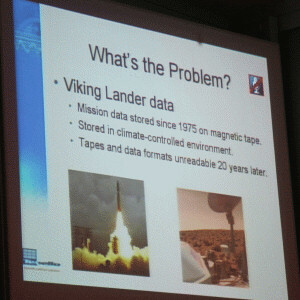 Keith described the climateprediction.net project, which had been built using the same framework as the SETI project to allow many PCs to work on problem. This is the world’s largest experiment to attempt to forecast the climate of the 21st century. 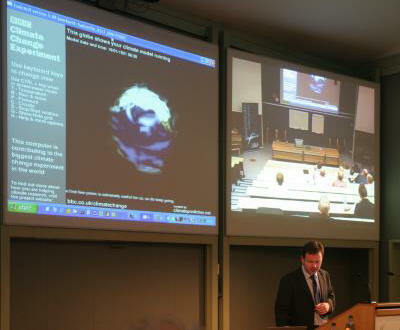 Keith described the background to the experiment (developed in part by Tessella, with Oxford and Cambridge Universities, CCLRC Rutherford Appleton Laboratory, the Met Office, and others), and showed how the software could help scientists to understand the global climate. Keith’s slides are here (1.3MB) and also linked from our downloads page. 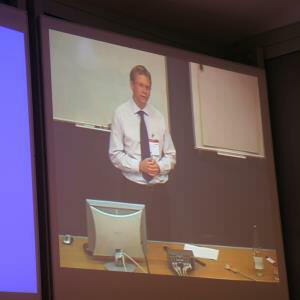 Our speaker from Daresbury was Peter Lloyd, also of Tessella. Peter described the issues surrounding Digital Preservation; with several examples of very public digital records which were nearly lost. Peter discussed the challenges of ensuring that the digital information created and stored today will be accessible for as long as it may be needed. Peter’s slides are here (614KB) and also linked from our downloads page.